We've infused Jelly Beans with the yummy taste of Wild Chokecherries! Who doesn't love Jelly Beans? 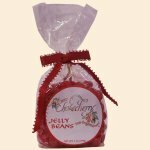 Now Jelly Beans with the great Wild Chokecherry taste! You don't have to wait till Easter for this great treat. One bag won't be enough! Great for gift giving or keep em' for yourself as a gourmet treat. A favorite for kids of all ages. Ingredients: Sugar, corn syrup, modified food starch, natural & artificial chokecherry flavor, colors added (red #40 & blue #1), citric acid, confectioner's glaze, tapioca, dextrose, carnuba wax, mineral oil. Please note: some or all of our products may be manufactured &/or processed in a facility that uses &/or processes one or more of the following: peanuts, tree nuts, milk, eggs, soy &/or wheat products.